Thanks to Rachel H, who is part of the design team at CookingSchools.net, who submitted the image below. She and her team created the graphic below that highlights a few health benefits the popular hot sauce can provide. I know many people who use Sriracha on oysters so I was glad to post this for Rachel. While visiting old friends in Tampa last weekend, we dined at one of our favorite restaurants -- Mise en Place. 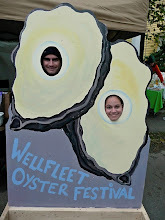 We were pleased to see oysters on the menu, especially since the featured oysters were Connecticut Blue Points. 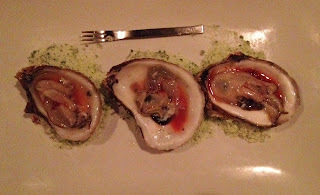 The mildly salty oysters were offered three on a plate, served with a Blood Orange pink peppercorn mignonette in the shells' cups for $10.25. This turned out to be a great modern twist for a classic oyster.